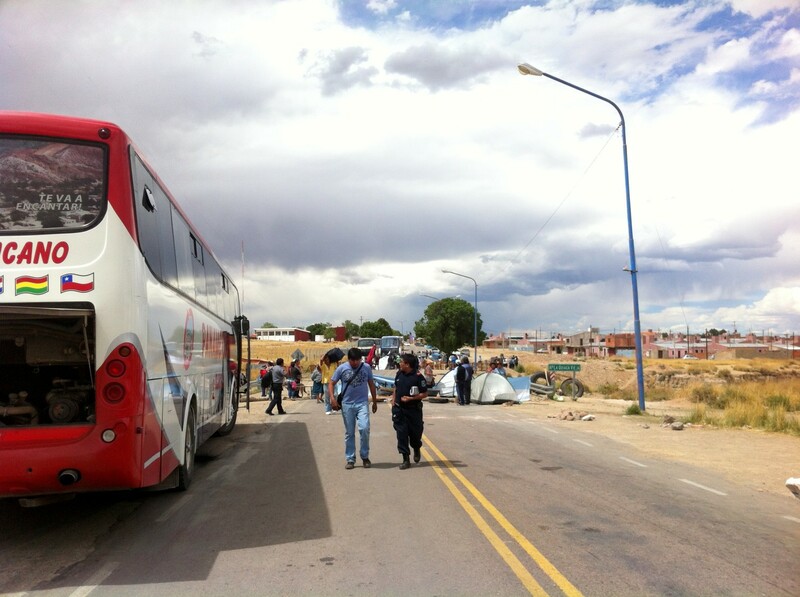 From Uyuni, one can take a train or bus directly to Villazon, or stop by Tupiza and take a bus to Villazon. 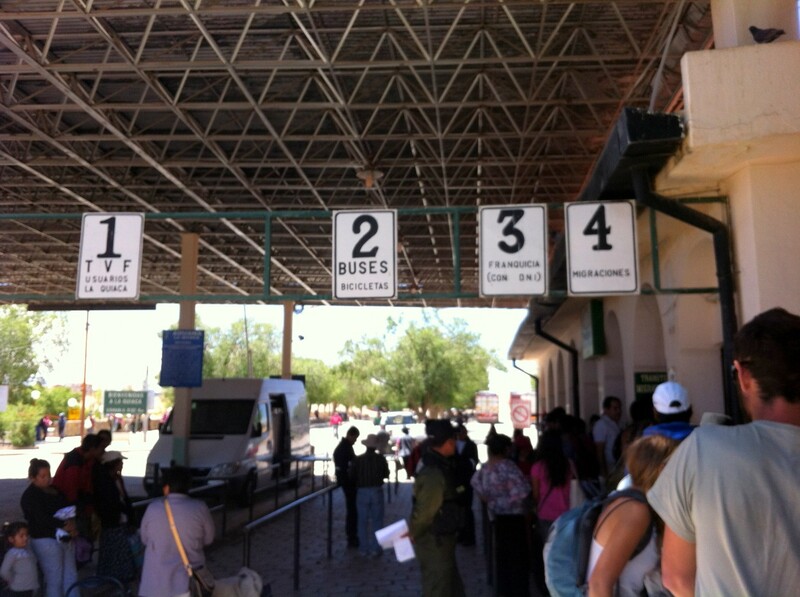 The bus station was only 15-20 minutes walk to the border immigration office. Along the way there were countless shops and stalls full of imported goods. Especially common were hiking and trekking supplies. The Argentine pesos (ARS) is extremely unstable. So much so that even Bolivian pesos (BS) can fetch a 30% mark up from the official rate. If you don’t have US dollars when you get to the border, pull out more BS from the ATM and exchange for ARS to get almost the same rate as the blue dollar (unofficial exchange rate for USD to ARS). 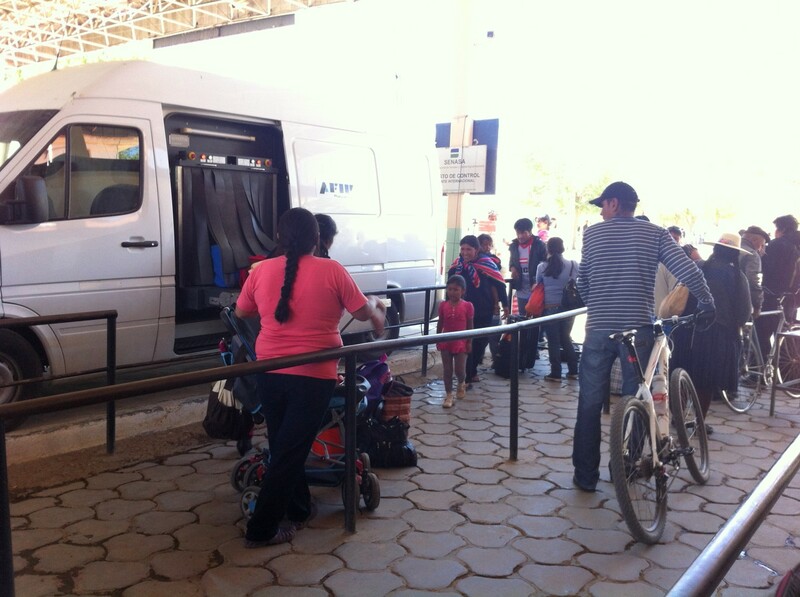 You will need ARS after you cross the border to get a cab or buy bus ticket. For all foreigners traveling on foot, go to line #4. You will stamp OUT of Bolivia at a window under the sign of line #4 and then stamp into Argentina right around the corner. They try to make it a simple process but the line can get really long. I waited for about one hour to get through, compared to other’s experience on forums, it’s quite short. I did take the early bus out of Tupiza and got to Villazon before noon. The line can get up to 3+ hours to pass on a busy day. Everyone who gets stamped into Argentina must then go through an X-ray line. That white van is the X-ray on wheels. I was very confused for a couple minutes, just follow everyone else and toss your belongings into the van. After the border crossing, I was officially in the city La Quiaca but still a 5-6 hours ride from Salta. The bus station was relatively close, walkable in 20 minutes but the heat was really building up and I didn’t want to miss the next bus, instead I took a cab for $10 ARS. The bus to Salta was $190 ARS. However, there was apparently a protest and road block which means we had to ride to the road block by bus, walk across the road block, and get on another bus on the other side. When I arrived to Salta it was quite late, and my first hostel choice was fully booked and I had to walk around to find one with vacancy. Luckily I did, but FYI, Salt’s a popular stop, make reservations! Next story Why Travel Long-Term? Or Solo?